Learn more about arnica — an adorable herb turned apothecary miracle. Though there are a number of species of arnica, the most popular is arnica montana, also called mountain tobacco, mountain arnica, wolf’s bane, and leopard’s bane. The names wolf’s bane and leopard’s bane are also used for acontium. It’s long yellow petals depict its sunflower family, and flowers from May through August. Arnica has been used for skincare and anti-inflammatory properties for centuries, since at least the 1500’s. Though it can be toxic in high concentrations ingested, it is a very common homeopathic aid for bruises and swelling today. Arnica’s upper leaves are level to the ground, ovate, veined and hairy; while lower leaves have rounded tips in a rosette pattern. The flower’s petal are normally yellow or sometimes appear light orange, oppositely arranged, and spear shaped. Two or three flowers grow per stem, and flowers are typically two or three inches in diameter. Stems are hairy and rounded. It grows mostly in the northern hemisphere, especially liking mountainous and acidic soils. The plant grows one to two feet, sticking out amongst other plants. The active component in arnica is called helenalin. It is possible to be sensitive to helenalin; so if you develop a rash or stomach pain after taking arnica you may be sensitive and should discontinue use. Helenalin is a known anti-inflammatory, and as such, tinctures, pills, balms, and oils of arnica have dramatic anti-inflammatory properties. The fatty acid thymol has also been found in arnica montana, which has known antibiotic properties. Pain reliever for bumps and bruises. Arnica is most well known for its ability to reduce swelling and pain in everyday bumps and bruises. Because of this, most moms keep arnica balm on hand at all times. Studies have actually shown that arnica relieves arthritis pain as well as a non-steroidal anti-inflammatory. It is also useful for those suffering from carpal tunnel to reduce pain and inflammation. Reduce skin inflammation and swelling. Joint pain, swelling from injuries, inflammation from chronic diseases can all benefit from regular arnica oil or homeopathic use. Limit muscle pain and soreness. Whether you are an athlete or have a road trip planned, arnica is great for limiting muscle pain and soreness, and aiding in bodily recovery. Calming after an accident or injury. Moms of old have used arnica to help reduce overall inflammation in the body after a (non-serious) injury. Arnica is great at boosting hair growth. If you suffer from hair loss, try adding arnica oil to your shampoo and massaging into your scalp often. 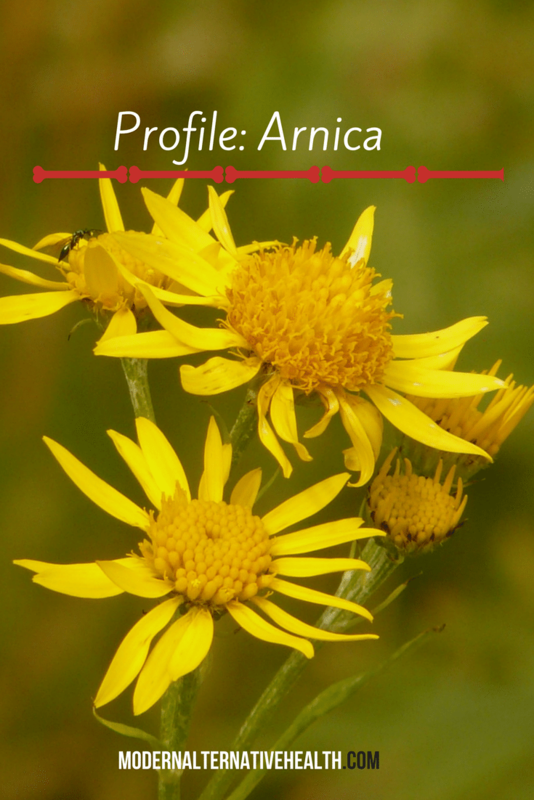 Arnica can be used as oil, essential oil, tincture, homeopathic pills, and in balms and salves. The essential oil should be diluted heavily with a carrier oil, and a spot test should be performed before using a large amount. It is not suggested to use arnica oil as aromatherapy because of this plant’s strength and toxicity. Tinctures, homeopathic pills, and balms and salves sold are very diluted and safe. Grab some arnica oil, balm, or homeopathic to keep in your natural medicine cabinet for the next “oops” big or small. Keep arnica oil or salve on hand to combat bug bites or stings. Keep arnica pills (homeopathic) or tincture on hand in your car so that you can use for on the go bug bites, bumps and bruises, or long-drive muscle soreness, or an accident. If you suffer from joint inflammation or arthritis, try arnica oil or salve to ease the pain and swelling without the side effects of prescription steroids and pain medications. If you suffer from hair loss, try massaging arnica oil into your scalp twice per week. Do not ingest raw arnica, and do not apply to any open wound, cut or scape. Homepathic arnica pills are heavily diluted, and thus are safe. Look for 30 x (or c) homeopathic dosage, and be sure to give children half the dosage. It may be a good idea to try a small patch of arnica oil on skin for first usage to ensure you do not have a helenalin sensitivity. Be sure that any arnica you use is highly diluted, especially in its essential oil form. Arnica has been every mom’s secret to curing that day to day bruises and bumps, as well as treating ongoing inflammation. If you don’t have arnica in your apothecary, it’s time to stock up. 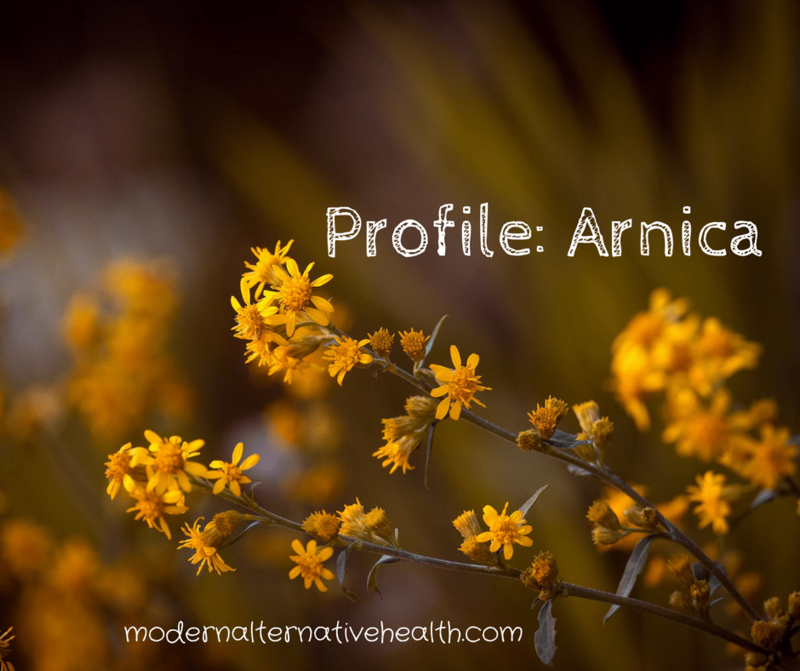 Do you use arnica in your natural medicine cabinet? How do you use it?